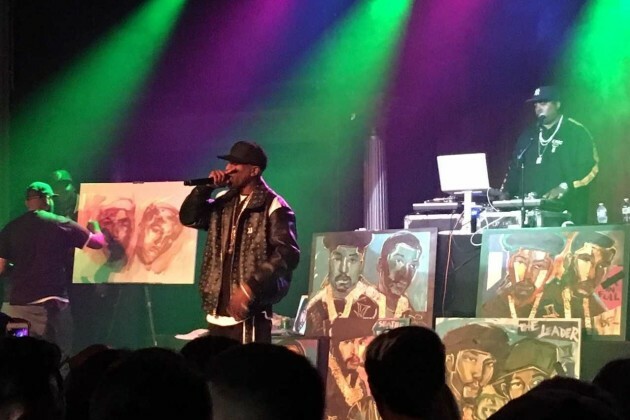 While other classic hip-hop acts have been relegated to I-love-the-‘80s/’90s type of tours where we're lucky to get five songs from them, Eric B. and Rakim gave fans a real show Wednesday night at the Varsity Theater in Minneapolis. And it was really, really fun. On their first tour together in 25 years, the old-school New York duo – whose mouthpiece, Rakim, is widely considered one of the genre’s greatest wordsmiths of all time – performed for over an hour. They delivered nearly 20 songs, including some stellar deeper cuts. They even brought along a graffiti artist to fill up some canvases on stage with them, like a Bronx version of Cloud Cult. The real-life Eric Barrier and William Griffin Jr. also took time to speak out against a prominent local incident, the 2015 shooting death by a St. Anthony police officer of Philando Castile, whose mother was purportedly in the audience. “We can celebrate his life, and honor all the other victims of injustice,” Rakim proclaimed, as the nearly thousand fans held up their cell-phone lights at his urging. Aside from that solemn moment, Wednesday’s show was resoundingly high-spirited and playful. The festivities started with the braggadociously feminist opening set by pioneering Los Angeles rapper Yo-Yo, who strutted and flipper her hair around like a proud peacock during her finale/anthem "Can't Play with My Yo-Yo." Rakim then came out and started off by trading a few funny barbs with his older DJ/producer partner: “You had a couple days off; did you get a little rest?” he asked Barrier. But Rakim poked a little fun at himself, too, acting as if he were 25 instead of 50 and repeatedly bragging that he was in such good shape he didn’t need to take off his rather thick leather jacket. “I haven’t broken a sweat yet!” he bragged toward set’s end, still donning the leather. That he talked so often between songs – a little too often, actually, sometimes breaking the momentum -- may have been a cover for Rakim to catch his breath. He certainly didn’t miss a beat during the songs, though. The fiery, 1992-era opener “Don’t Sweat the Technique” (a fitting choice given the jacket bit!) gave way to the slower but still lyrically loaded gems “I Know You Got Soul” and “In the Ghetto.” Fans went crazy every time Eric sparked up a track from the duo’s 1987 debut “Paid in Full,” also including “My Melody” early on and “I Ain’t No Joke” and the title track near the end. Rakim even made light of the album’s continued popularity in the host city, which he continually mispronounced. The set list went much deeper than “Paid in Full,” though, with “The Punisher,” “Mahogany,” “Follow the Leader” and especially “Microphone Fiend” also earning ample excitement from the crowd. It’s true: Rakim didn’t ever appear to break a sweat. But audience members down front sure did. Who needs Ice Cube? Fun to hear Can’t Play With My Yo-Yo by one of hip-hop’s pioneers, @yoyofearless.